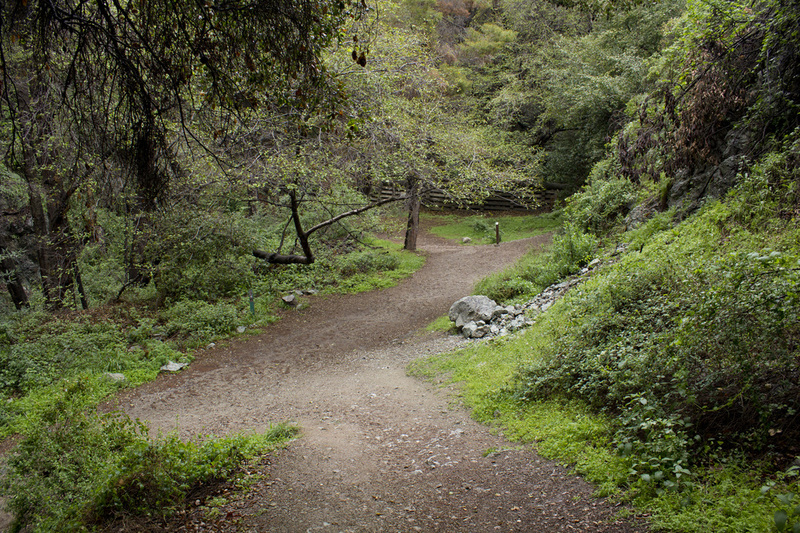 Monrovia Canyon Park is a hidden little gem owned and operated by the city of Monrovia in the foothills of the San Gabriel Mountains. 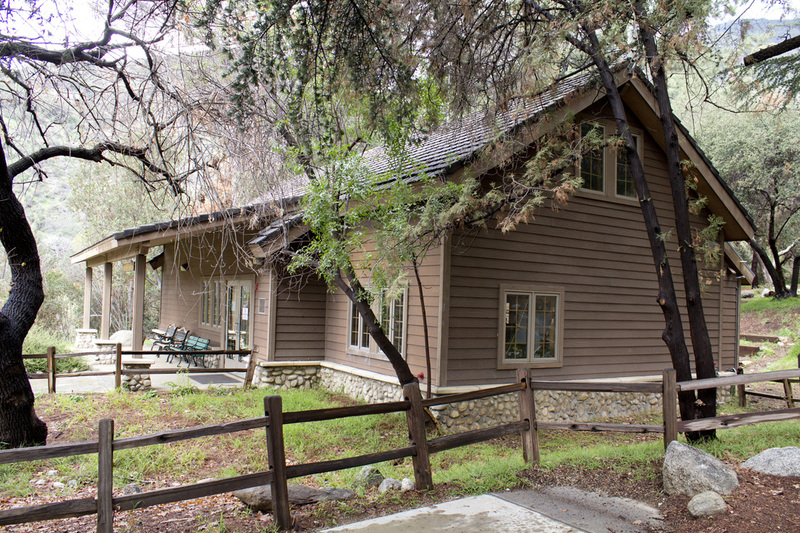 Offering a number of amenities such as picnic areas, overnight camping, a nature center and facility rentals for weddings and birthday parties, this beautiful and secluded canyon park is often overshadowed by its neighbors such as the Eaton Canyon Nature Center. 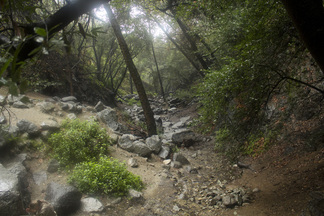 Of particular interest to hikers are the trails: the historic Ben Overturff Trail, a 3.5 miles trail through some of the last remaining undisturbed wilderness in the San Gabriel's and the trails to Monrovia Canyon Falls. 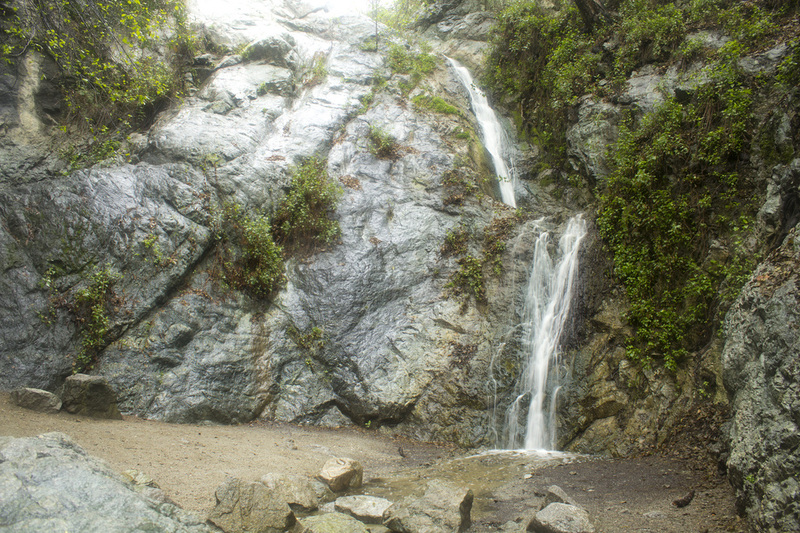 While not quite as spectacular as the nearby Eaton Canyon or Sturtevant Falls, the Monrovia Canyon Falls do consistently run year round thanks to an artesian spring. The 30' two-tier cascade tumbles down a granite wall covered in vines and moss and spills into the canyon along a small creek bed. Because the water flows throughout the year, this canyon is one of the lushest riparian landscapes in the Los Angeles area. While some hikes in the area have intermittent shade, most are sunshine hikes, meaning you are fully exposed to the full force of the sun. Not so in Monrovia Canyon. Here, the canopy of alder, sycamore and oak is quite dense and the sunlight extremely filtered. I had the opportunity to hike the canyon during a recent thunderstorm and managed to stay quite dry under the canopy all the way to the falls and back. There are three trails leading to the falls, each with it's own vistas, special features and lengths. 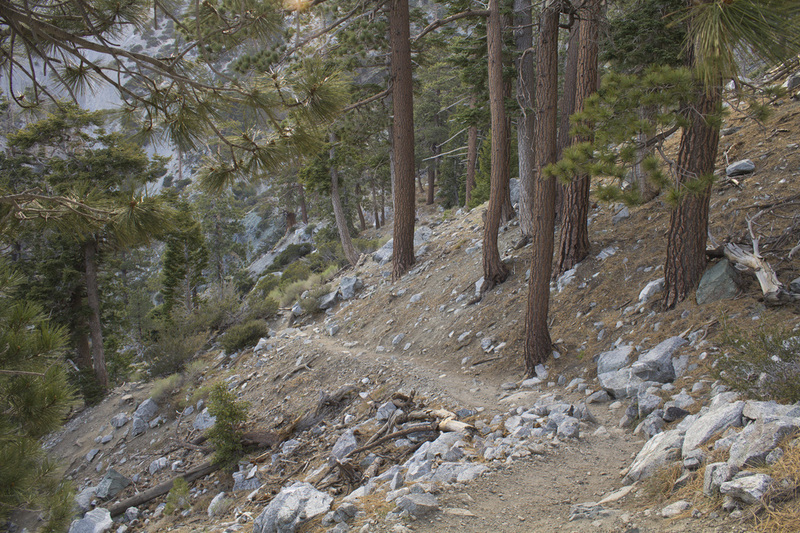 The first is the Bill Cull Trail, which begins near the ranger station at the entrance of the park. This trail is 3 miles in length round-trip and offers views of the nearby Sawpit Dam. It also has the greatest elevation change and is a little more challenging, both in its elevation gain and navigating the junctions with the Guided Nature Trail and the Falls Trail. 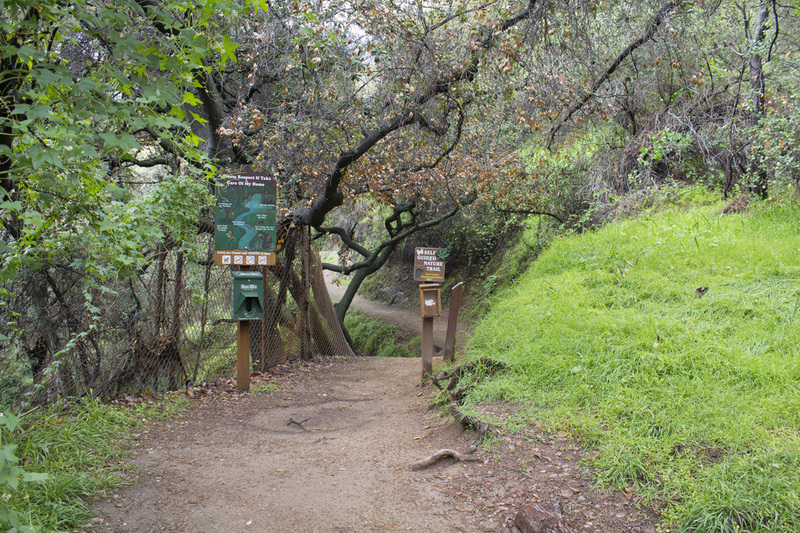 The second trail, the Guided Nature Trail, begins near the middle parking lot on Canyon Blvd. Hiking to the falls on this trail is about 2 miles round-trip and features trail markers detailing the flora and fauna of the area before connecting with the Falls Trail. The third option, and the one detailed in the directions below, is the shortest and easiest of the three hikes. Falls Trail unofficially begins at the Nature Center at the upper parking area. It passes between the Nature Center and Rest Rooms, wrapping behind the Nature Center and through the Mal Packer Mesa Picnic Area for about .1 mile. At the rear of the picnic area, a posted sign indicates the official trailhead. 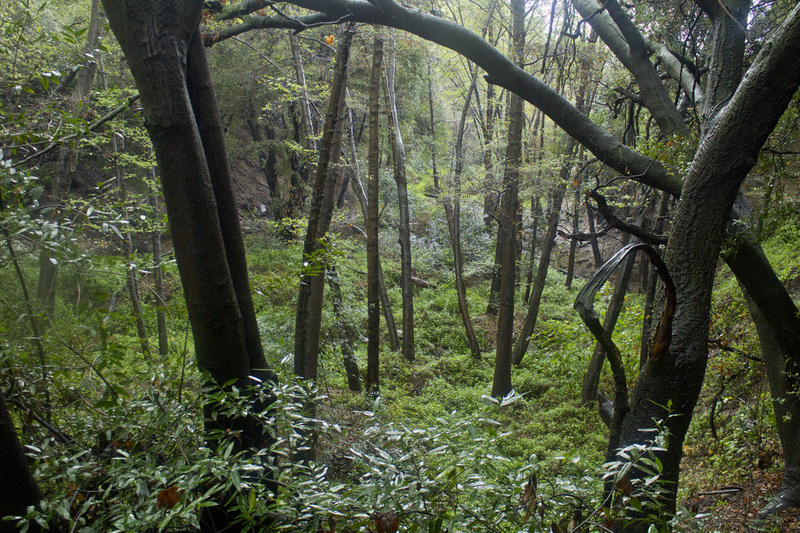 Here you will descend into the canyon and meet up with Guided Nature Trail in about .1 mile. At this first and only junction, veer to your right and keep the Check Dam to your left. You will cross over the creek shortly and the trail will continue along the western bank of the creek for about .5 mile to the falls. This hike is excellent for novice hikers or parents with children. For those with very small children, it should be noted though the trail is fairly level, the embankment next to it can be steep at places. A tumble down the side could be dangerous. For those who want to turn this hike into a challenge, consider partaking in the City of Monrovia's Fountain to the Falls Race, a seven mile foot race from the library in downtown Monrovia up to the falls and back. 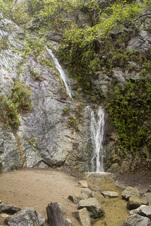 But for those just looking for an easy way to Monrovia Canyon Fallsenjoy the serenity of a babbling mountain stream as it tumbles down a cliff face, Falls Trail is the answer you are looking for. Take the 210 Freeway to Monrovia, just east of Arcadia. Take Exit 34 onto Myrtle Ave. and drive north for 1.1 miles to Foothill Blvd. and turn right. Continue on Foothill Blvd. for four (4) blocks and make a left onto Canyon Blvd. Drive north for 1.6 miles to the park entrance. Note that you will have to make several right hand turns to stay on Canyon Blvd. Pay the entrance fee at the kiosk station or inside the ranger’s station. Continue another .6 mile to the Visitor’s Center parking area. Parking is limited and fills up quickly on weekends. Weekdays can find the park virtually deserted. veer to your right and continue straight on Falls Trail. nestled in the foothills of the San Gabriel Mountains.